We reached out to our BASIC Fund community to ask: What inspires you about the Bay Area? What do you love? Our Scholars sent in so many amazing works of art, depicting all of their favorites things and places from around the Bay Area. We want to share just a few with you, including the winners and runners up from each age category of K-2, 3-5, and 6-8. 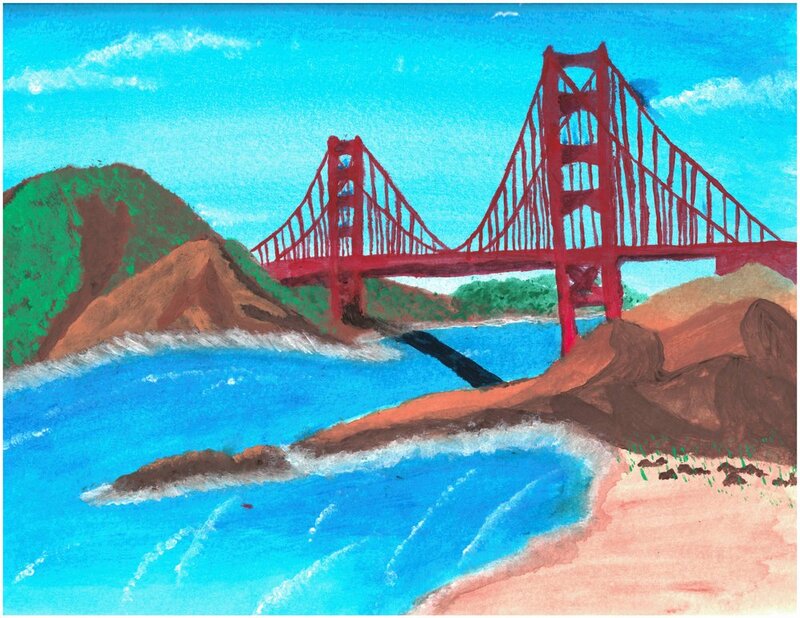 Sofia C., Age 12, receives an honorable mention for her work ‘The Golden Gate’, done on canvas. Victor M., Age 11, won the 3-5 category with his ‘A Day At the Beach’. The Half Moon Bay inspired him for the good times he has had there and the beautiful sights he has taken in. Kiana M., Age 8, gets an honortable mention for ‘The Big Carnival’, showing the carnival she goes to every summer at the Alameda County Fair where she has a lot of fun with her family. Posted on February 28, 2019 by Matt Nosco. Raising two sets of twins comes with a number of challenges, and for Jeannie, a single mother, an excellent education was one of the most important ones to navigate for her family. Both sets of twins ultimately attended the Tehiyah Day School in El Cerrito. Their curriculum there focused on math, science, English, social studies, and all the usual subjects – it also put an emphasis on building community, respect, and acceptance. Those were lessons that both sets of twins learned well alongside their peers. The older twins, Emma and Asher, had a class that had a group tzedakah project – charitable giving, grounded in the idea of justice and righteousness that is seen as an ethical obligation to do what is right and just. They were appreciative of the scholarships they and their family received and proposed The BASIC Fund as the organization of choice for the class, ultimately raising hundreds of dollars to support future BASIC Scholars. The older pair are now off to college, with Emma attending Cal Poly San Luis Obispo where she is majoring in Biology and aspiring to become a physician. Asher is attending Columbia College Chicago, where he is earning a Bachelor’s in Music and releasing albums as well as performing in the city. The younger pair of twins, Rena and Ezra, are currently exploring their next steps for the 2019-20 academic year as they’ll enter high school, but Jeannie is sure of one thing: they’ll do just fine with the strong foundation they worked to build at Tehiyah Day School. If you know a family you believe would benefit from The BASIC Fund, direct them to our How to Apply page. Posted on February 26, 2019 by Matt Nosco. When the wildfires ripped through California in 2017, they left devastation in their wake. Santa Rosa was among the hardest hit, with the Tubbs Fire destroying nearly 3,000 homes. St. Eugene Cathedral School in Santa Rosa, a BASIC Fund partner, was impacted in a number of ways. “Twenty-one students and five staff members lost their homes, their pets and all their belongings. Other students’ homes were damaged, and one boy’s aunt and uncle perished in the fire. Half of our students whose homes ultimately survived were awakened in the middle of the night and driven away to safety. They, along with many other students, were evacuated at least once while firefighters battled to bring the fires under control,” Principal Barbara Gasparini said. In the weeks following the tragedy, the BASIC Fund and its supporters tried to better understand what role they could play in the recovery. Ultimately, donors from the BASIC Fund provided for additional tuition coverage for the families, and helped to hire a counselor who served the student body. The recovery has been difficult, and it is still far from finished, but the St. Eugene community carries a strong hope for the future. Principal Gasparini wants to see the students and families continue to heal, becoming strong and resilient. The students in turn have realized how important it is to receive help in their time of need, and set themselves to the task of raising money for those in need in Paradise following their recent fires. “As awful as the firestorms were, it has been a blessing to see the caring and kindness BASIC Fund employees and donors have shown toward our community, and that members of our community have shown toward each other and beyond,” Principal Gasparini said. If you want to see other ways The BASIC Fund is making a difference, check out http://www.basicfund.org/ourimpact. Steve and Roxy Klein have always understood the importance of a strong education – from the opportunities they had to those they were able to provide for their children, it was easy to see education at the center of it all. So, it made sense that they would seek to share those same opportunities with their community. They started with a few private scholarships of their own in the East Bay, and soon a friend heard about what they were doing and put them in contact with Jim McCarthy, the founder of the BASIC Fund. “We found that the BASIC Fund was a fully functioning organization, doing at scale, exactly what we had been doing in a very small way,” Steve said. From that connection, they knew they wanted to be more involved in BASIC Fund’s work, so Steve joined the board in 2007. Since then, they’ve worked tirelessly to support the work and scholarships, but Steve knows there is always more to be done. What has really kept them connected to their work throughout the years is the school visits. If you’re interested in attending a school visit and seeing the impact of BASIC Fund scholarships at work, please contact Michelle Harris at michelle@basicfund.org. While we often get the incredible fortune of being able to work with an entire family, one exceptional instance stood out to us as we embarked on the 2018-19 school year. Mikenzie, Cheynne, and Bentley are all part of the BASIC Fund, all attending Harvest Christian School through their scholarship award. More notable though, is that they are triplets and are all kicking off 1st grade in the same class. For their family, Harvest Christian has been the complete experience – from the staff, teachers and programs to the other students and families and the level of engagement they bring, it’s exactly what Lindsay wanted for her triplets. “My kids do great at math and have really taken a liking to social studies. They have wonderful, unique, and educational field trips, school plays, family days, and they make it easy to be involved and active in your children’s learning environment,” Lindsay said. Here at the BASIC Fund there’s no better reward than hearing about how our families are thriving in and out of the schools they attend. If you’d like to see these success stories in action, contact Michelle Harris, Develop Director, at Michelle@BASICFund.org to schedule a school visit. Posted on October 22, 2018 by Matt Nosco. Curtis and Christine Gardner and their family are happy for the opportunity to support the BASIC Fund program. With a commitment to support youth programs in our community, they have been active donors and parent participants in their children’s schools for almost two decades – their oldest daughter is now a Freshman in college and their boys are in 11th and 7th grades. The Gardner family is committed to supporting the success of all kids in our diverse Bay Area community – whether it is to help develop mentors, offer clean safe places for children to play, ensure access to healthy foods and clean water – or supporting amazing schools like those in the BASIC Fund network. The Gardner’s also support children and the community through their other philanthropic pursuits with Curtis serving as a Bay Area Board of Directors member for The First Tee program and a Director of the Big Brothers Big Sisters of the Bay Area. Christine has developed a deep interest in environmental health education and advocacy, working over the past ten years to create ecoCouncils, that address sustainability at her children’s schools, as well as serving on the Boards of the San Francisco Parks Alliance, the Environmental Working Group in Washington, D.C. and the Woods Institute for the Environment at Stanford University. Posted on May 3, 2018 by Atalanta Powell. SAN RAMON, Calif.--(BUSINESS WIRE)--Chevron Corporation (NYSE: CVX) today announced a $1 million donation to the Oakland-based BASIC Fund to aid scholarships for the children of San Francisco Bay Area low-income families. The contribution is in honor of Chevron Chairman and CEO John Watson who is retiring February 1 after 37 years of service with the company. The BASIC Fund is a 501(c)(3) organization whose mission is to broaden the educational opportunities for inner-city children by helping low-income families afford the cost of tuition at private schools in the Bay Area. Chevron’s contribution builds upon a long-term commitment to supporting education in the communities where the company operates, with a particular focus on improving instruction in science, technology, engineering and math (STEM). Working with local partners, Chevron takes a comprehensive approach to education investments. This includes supporting teacher training, providing classroom resources, funding out-of-school activities, and developing partnerships with universities designed to strengthen faculty, curricula and student development. To learn more about the BASIC Fund’s programs in the Bay Area, visit www.basicfund.org and for more information about Chevron’s support to education: www.chevron.com/education. Posted on December 13, 2017 by Omar Abdelmegeid.